Note: Microsoft Outlook Installation Not Required!! Convert Outlook File Emails, Calendars, Contacts and Notes etc without any data loss. Outlook PST files converter permits you to convert selective or all items from an Outlook data file. This may carry items like: mails, calendars, contacts, notes, tasks and custom folder items into diverse file formats. 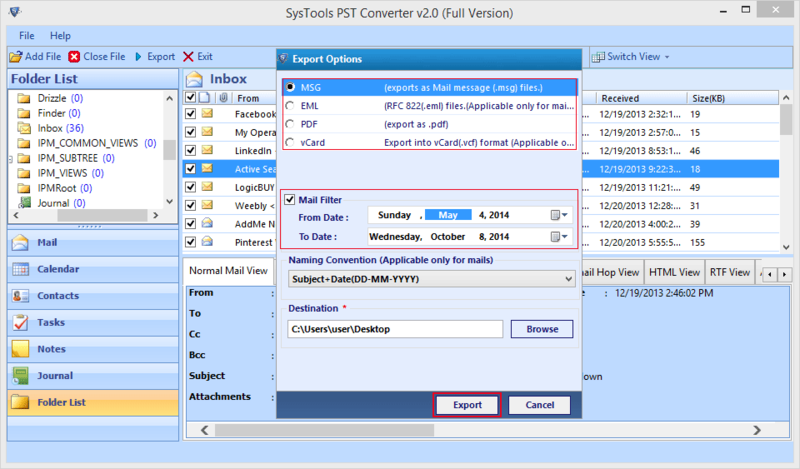 PST files converter accord an opportunity to convert Microsoft Outlook emails into MSG or EML file formats. As EML is a file format backed by multiple email applications like: Windows Live Mail, Windows Mail, Outlook Express etc. On other hand MSG file format can be exported into any Outlook profile. Create PDF file for all items present within Outlook PST file. Software will enclose attachments of email within same PDF, while converting. With this, a header opportunity is also accessible through which email header can be exported. You need to check or uncheck header option to enable or disable it accordingly. 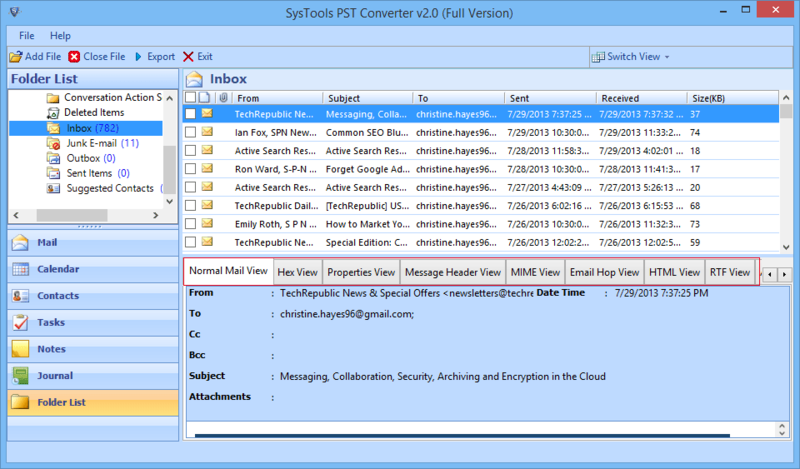 Outlook PST file converter to convert all Outlook PST file contacts as vCard. vCard is a electronic business card supported by several applications and devices. Software will generate a single vCard file for all contacts present in Microsoft Outlook address book. Each PST file you open and add with Outlook conversion software will first get scanned. Then the software will automatically save scanned file and prompt to close it before endeavor to open a new PST. MS Outlook conversion tool permits you to convert selective PST file items. If you need to save only few folders of scanned PST file then check particular items and software will convert it, alternatively all items will get exported in batch. Outlook conversion tool scans PST file contents and loads entire items of folders. Once you click on any of the Outlook items, it will load the content and create a quick preview of it. Attributes are also comprised like: Location, subject, start, end, categories etc. 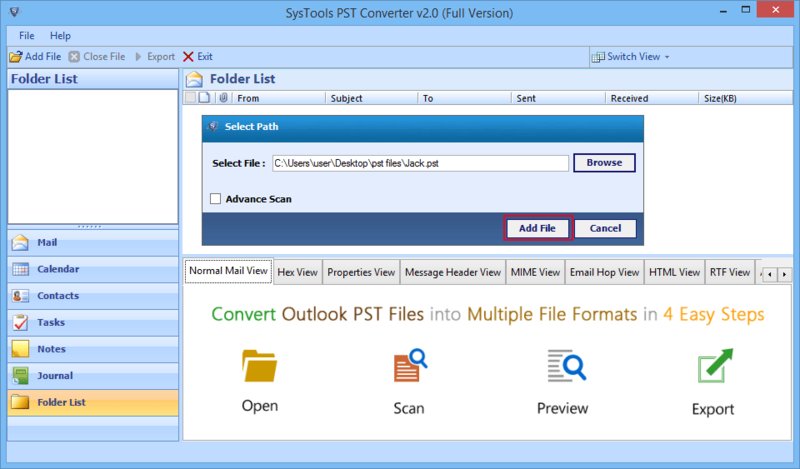 Outlook PST Converter first scans then load and then list all items with their properties. Now, if want you can rearrange all items like: Emails, calendars and contacts etc with their associated properties. Such as to, subject, from, received and sent date etc. arranged in a descending or ascending order. Email Filter: Helps you in exporting the selected data of Outlook Data file by providing an date range option where you have to just mention the "from" and "to". This option is most effective from the rest of them as you dont have to wait for the whole process of conversion and it saves your time. Select location of PST files from your system and start scanning process of PST files and after that preview loaded PST files. Among the four given format VCF, PDF, EML and MSG, select the desired option to convert Outlook PST. Choose destination location where you want to keep the converted PST file and then confirm destination location to save PST as PDF, VCF, MSG and EML. Take FREE Trial Tour to test working of application and get privilege to convert 15 Outlook emails and contacts to EML, VCF, MSG and PDF formats without spending single penny. 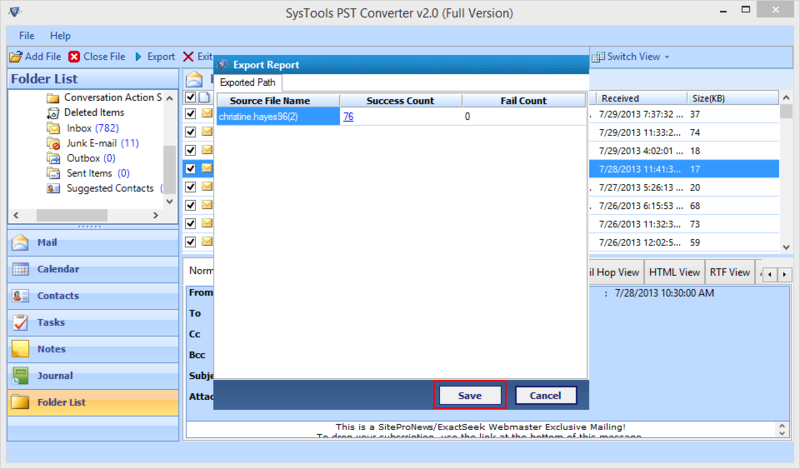 Acquire PST Converter to export Outlook email and contact files to PDF, MSG, VCF and MSG format. Software brings up all mostly used formats under single roof in order to increase accessibility of Outlook PST to wide application. More over that it gives opportunity to repair and convert corrupt PST with all information remain intact. 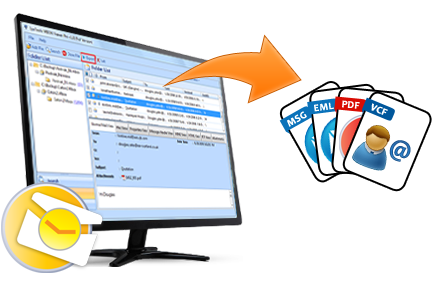 Watch Free Online Video to learn how software convert PST file to MSG, VCF, EML and PDF.